DS Group marked its foray into the Rs. 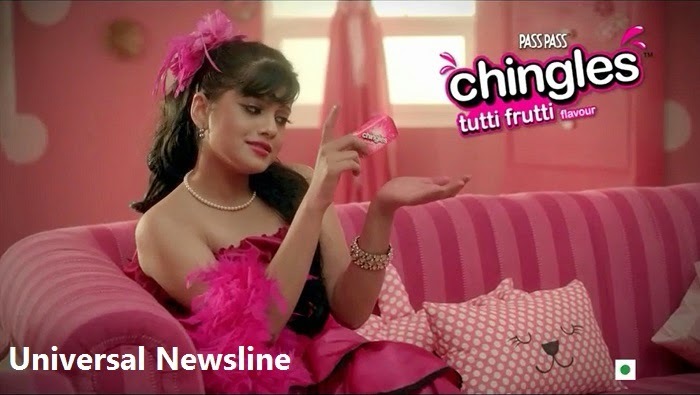 1600 crore gum category in 2011 with mini gums called ‘CHINGLES’. The new flavor ‘Tutti Frutti’ is also available in Rs. 1 sachet, Rs. 5 zipper and Rs. 10 Fliptop packs, just like the other existing Nimbu, Saunf and Mint flavours of Pass-Pass Chingles. Positioned as an antidote to seriousness, the new campaign introduces a new character LiLee who turns the tables on the Lee brothers- UngLee, KhujLee and GoogLee, by playing a prank on them. Created by Dentsu Marcom, the commercial is set to foot-tapping music and pays a tribute to the golden age of retro in the 70’s which had heroines dressed up in dazzling costumes and living in lavish houses. The film builds up the mystery of someone coming. LiLee the new character is shown singing ‘Dekho Woh Aagaya!’ and waiting for someone to arrive. This invites the curiosity and interest of the Lee brothers. They line up outside her door and try to peep in through the key hole one by one, wondering who is coming. LiLee punctures their curiosity by suddenly opening the door and telling the brothers that it is the new Chingles flavour, Tutti Frutti that has arrived, thus taking the trip of the Lee brothers.